Radical Grooves And Hometown Heroes: Cuba's Lasting Jazz Legacy As Havana prepares to host this year's International Jazz Day celebration, Jazz Night In America's Christian McBride shares how the island nation has shaped jazz in America and around the world. 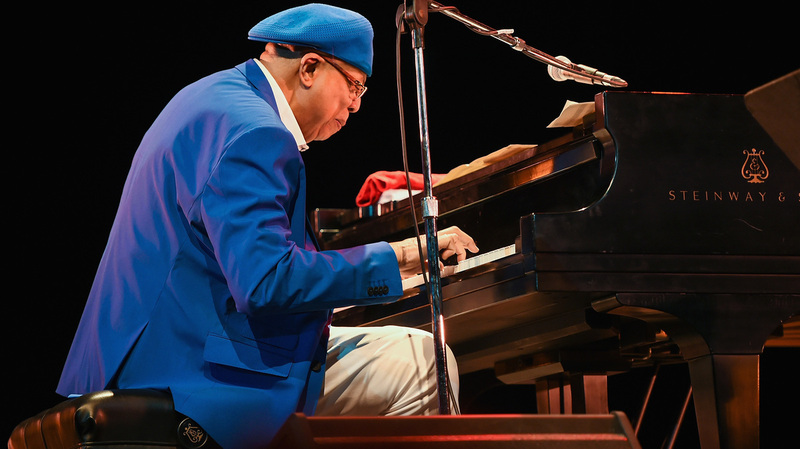 Cuban pianist Chucho Valdés performs at the Havana Jazz Festival in December 2016. Valdés is one of the artistic directors of this year's International Jazz Day festivities. This Sunday is International Jazz Day. It's a tradition that began in 2011, when UNESCO — the United Nations Educational, Scientific and Cultural Organization — designated April 30 as a day for celebrating jazz around the world. This year's primary International Jazz Day festivities will be held in Cuba, a place that, according to bassist and Jazz Night In America host Christian McBride, has played "a vital role in American music over the last five decades." In a conversation with NPR's Audie Cornish, McBride discussed how Cuban musicians have helped to redefine jazz in the last half-century and shared some impressions from his latest trip to Cuba, where he performed at the Havana Jazz Festival. Hear their conversation at the audio link and read highlights below. We think of fusion as some sort of a label that was created in the '70s, when young jazz musicians started to incorporate rock sounds into the music. But if you take fusion in its literal sense, that happened at least 30 years before that happened in the '70s, and it started with Dizzy Gillespie and Chano Pozo. "Manteca" was very groundbreaking in that the bass didn't play on the first beat. [In] all American music up until that point, the bass always played on the first beat, just to establish the beginning of the bar. ... It's just required, you know, particularly for dance music. So you had a groove that had no bass on the first beat. That was pretty radical at that time, but then you add those drums and all the rhythm that the horns threw in. And Dizzy decided, hey, this was a great groove, but it needs something else. So then Dizzy composed the bridge, and now you have one of the first examples of Cuba and America coming together to create a gorgeous baby. There were people sitting in the aisles, there were people lined up against the side of the walls, people sitting in the pit. And it was just a scene that I've never experienced. You talk about a hometown hero's welcome — never saw anything like that in my life. ... To see a non-vocalist have that much worship in his hometown ... that was really heart-warming to see.